I like Where the Wild Things Are very much. I think the monsters are very funny in the film. I like how they jump up and down and make noise and throw a lot of stuff around. But in the book, Max went to his room and the forest grew all around him. In the movie, he ran out in the street. I think it’s harder for you to go home when you run out in the street. If you just go off in your own room, you can always come back out when you want to, and it’s also easier for someone to find you if they’re worried about you. My favorite phrase in the movie is at the beginning, in the scene when Max looks at the globe in his room and there is a sign at the bottom from his dad: To Max, the Owner of this World. The monster named Carol says the same phrase later when he shows Max his kingdom. I like Carol and I don’t think he’s scary. He’s a little like me. I think he’s sensitive because whenever he’s sad or mad, he destroys everything. I like the sunny days that Max spent with the monsters. I know that Max will have to leave after awhile. The filmmakers did a good job copying the pictures of the monsters from the book, because after the movie I went back home and looked at the pictures in the book by Maurice Sendak again. I could pick out the monsters by name when I looked at the book, except in the book they’re just monsters with no names, and in the movie they have names. Although, there’s a bull with people’s feet on the book’s cover that has no name in the book and also doesn’t have a name in the movie. It’s so random that the monsters have generic names, except for Judith and Ira because I don’t know anyone with those names. The fort in Max’s room at the beginning of the book, and the part with Max running downstairs with a fork after his dog, are right at the beginning of the movie. It doesn’t scare me to see the scene in the movie. I feel like I’m Max running down the stairs chasing his black dog (but in the book he’s a white dog) because the camera was jumping around really fast. I can’t explain everything in the movie, like the scene with a giant sheep dog suddenly appearing and running away on the sand when Max is taking a walk with Carol to see his kingdom. Why Alexander played with a cute kitten also doesn’t make sense to me. It’s so random because on that island, you would think there are only monsters and not normal animals. But overall, I thought the movie was funny and I enjoyed it. 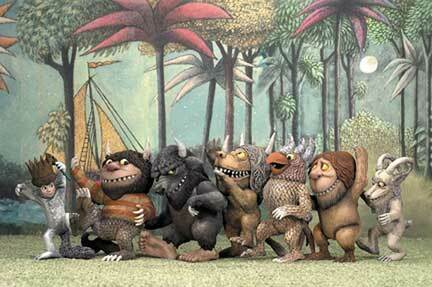 Where the Wild Things Are was an enjoyable romp for me. It’s a good family movie laced with the positive, untarnished themes of family, imagination, and good adventure. Despite some early scenes featuring the sensitive Max (Max Records) acting up, destroying parts of his sister’s room in a fit of rage, and running away from home when his mother doesn’t pay attention to him, most kids probably won’t be impacted by it at all. All kids cry when they’re neglected or their fort is wrecked. They blow up at their family when they’re fed up with being ignored. Running away from home is exaggerated, but even if the original book didn’t include this plot device, it’s a common theme in children’s books. It isn’t something that will be planted into children’s mind and trouble them. Max’s little boat sails day and night to the land of the Wild Things—a group of whimsical creatures that seem like a dysfunctional family. One of them, K.W., has apparently run away with her friends Bob and Terry, much to the disappointment of their leader, Carol, who appears lonely, misunderstood, and sad at first as he smashes their huts. Naturally, Carol is intrigued by the small newcomer. The rest of the film is basically lighthearted scenes of Max—King of the Wild Things—and his subjects jumping around to the music of Karen O, interlaced with emotional moments of Max finding out more about his new friends. When Max gets home and hugs his mother, their reunion seems pretty resolved, but our last sight of the monsters is slightly confusing because Max’s relationship with them is somewhat unevenly treated by the director. While the characters have been expanded from the book, they aren’t played to their full potential. Carol’s sensitivity and source of frustration is never explained, Ira and Judith’s unusual romance isn’t shown much, and we never do find out what caused K.W. to leave or why she seems to be the most understanding of Max. I guess you could say I was disappointed by how it turned out, but I suppose I shouldn’t have expected a full hug-and-make-up sequence between Max, Carol, and the rest of the monsters. Maybe such a tidy ending would have made it seem like Spike Jonze had underestimated the minds of his intended audience by giving them a family-friendly, watered-down, happy-mushy ending. Maybe from the director’s viewpoint, the ending was subtle and well handled. Every good work of art, as they say, can be viewed a number of ways, and the bottom line is that Where the Wild Things Are is a good movie for young kids and art-house snobs alike. It doesn’t underestimate its audience like a squeaky-clean Disney film would, and manages to be fun and childish yet intelligent and dark at the same time. I’m intimidated by your nieces, PCN, in the nicest possible way!! They are astute and literate. Thank you for the excellent reviews, Mena and Aline! Thanks, Shell. Mena is also a gifted artist. I’m going to recommend that she checks out your artwork! Holy sh*t! Please tell me your kids responses were heavily edited and not spontaneous or I’m going to think they are crazy precocious. I was NEVER that thoughtful as a kid. I’m still practicing to be that thoughtful now. Wish I could say that. Almost no editing was required! Their reports are always super clean; the grammar, punctuation, including the hyphenated words—all theirs. As a grammar nerd myself, I can’t tell you how happy that makes me. Thanks Aline and Mena for your wonderful reviews. I think I’ll share them with my kids for your keen perspectives. I’d love to hear what your kids think of the movie! Well, out of the mouths of babes…. I don’t have any children. Since I was genuinely disturbed by that opening sequence, I figured anyone under the age of 12 would be at least a little frightened. Evidently I was wrong because these two junior critics feel otherwise. Both these accounts were well thought out and insightful. Who needs Siskel and Ebert anyway? Hi Eric, your opinion wasn’t wrong. You were just looking out and that’s cool. I saw this over the weekend as well and brought along my two nephews. They are ages 5 & 7. The youngest one spent most of the movie in sitting in my lap holding on for dear life, but the older one seemed okay with it. He did ask me why Max’s dog didn’t bite him when Max finally grabbed hold of him. They both loved the wild rumpus and dirt clod fight though. I just kept thinking that Max and the monsters needed some serious therapy. Well, as long as your nephews don’t require therapy after this movie, it’s all good! Thanks, GMR! I thought they brought up some interesting points and questions that I haven’t seen in any adult’s review. I’ve been to this movie today with my eight year old son. He doesnt understand english but still became very scared of the monster trying to eat the child when he became upset. Had to leave the movie before it ended.